In the first scene, Lear makes a series of errors: he divides the kingdom, he banishes his only honest daughter, and he gives power to his children. Reasonable though retirement at age eighty may seem, the Fool at least sees it as a disruption in the natural order of things. Gloucester too thinks that the world is upside down, but he chooses to blame the "late eclipses of the sun and moon" (1.2.106) for the disturbing things that are happening. 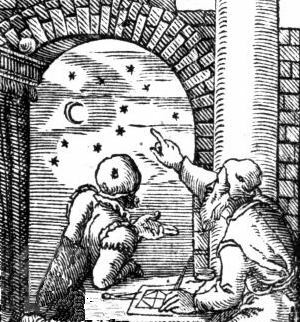 Edmund is more skeptical than his father, and goes so far as to parody his belief in the influence of the stars*. But Edmund swears fealty to a different kind of Nature, one more akin to the views of human behaviour explored by Machiavelli. Edmund: . . . O, these eclipses do portend these divisions . . . I am thinking, brother, of a prediction I read this other day, what should follow these eclipses. . .